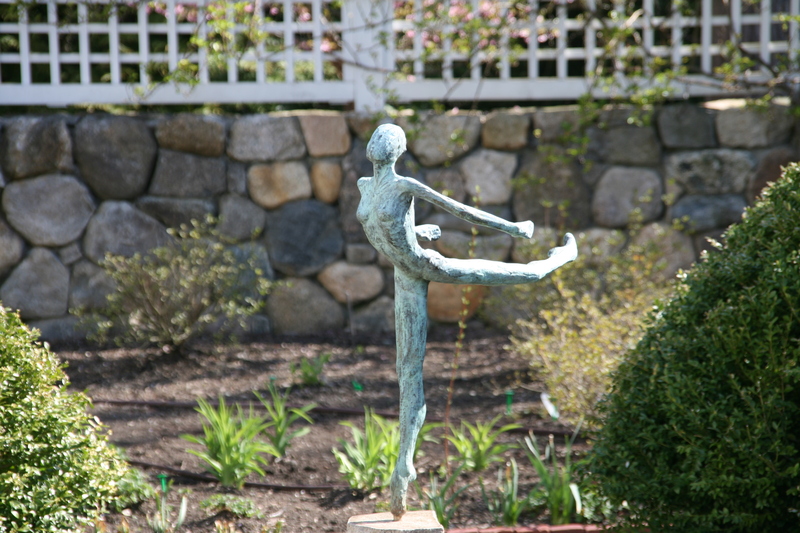 As of last week, my dancer has found her final position, poised on her plinth in my garden. It has been a long journey for her, one that started two years ago in Paris, France, continued with a Channel crossing on the Eurostar on the lap of my husband, then unceremoniously stuffed into a (specially purchased to fit her) suitcase in London and flown (in the cargo hold) to Boston. Our journey together began, in June 2011. I was in Paris staying in the 14th arrondissement. I was out for a stroll on a Sunday morning and came upon the Marche Edgar Quinet. This marche, or market, is quite a well-known open-air market for food, but on Sundays artists take over the stalls. The Sunday art market is a quiet affair, smaller than the food market, with a high caliber of artist. I had come to Paris to visit gardens with hand luggage only and wandered the long line of vendors absent- mindedly admiring their wares, as one does when one knows there is no chance of a purchase. Quite literally in the last stall in the long line of stalls was Hannah Laoust and her bronze dancers. It was love at first sight. I had wanted to add a piece of “garden art” to my garden, but it is a delicate process, fraught with peril. 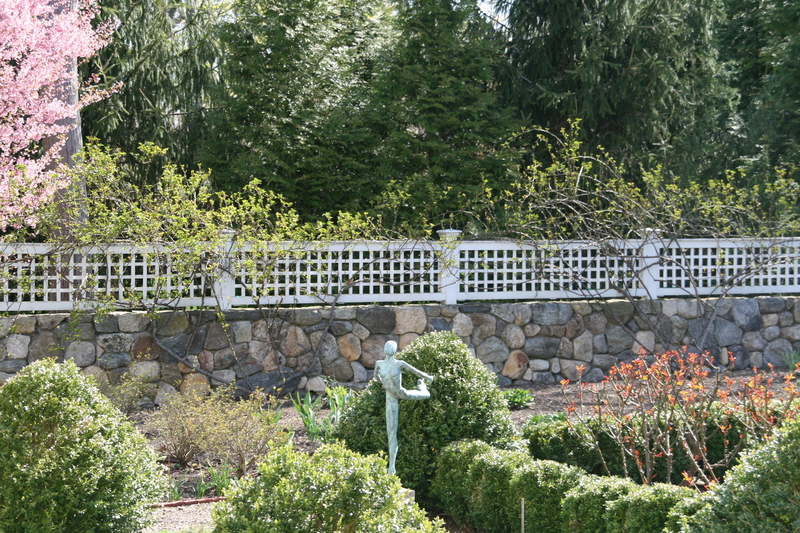 Choose the wrong piece of art and a beautiful garden can become prone to the ridiculous. But once I saw Hannah’s bronzes, I knew my quest was over. I had found the one piece of garden art I would put in my garden. The only slight difficulty was the fact that the sculpture I wanted, Le Lac arabesque attitude, didn’t exist, Hannah would have to make her for me. No problem for Hannah, but for me it presented the issue of how to retrieve a bronze sculpture from Paris when I live outside Boston (yes, yes, I know shipping, but I really don’t like to pay shipping cost, never-mind international shipping costs, and I did not want to subject my beautiful ballerina to the international post). As fate would have it, I was able to return a year later to Paris and pick up my ballerina. 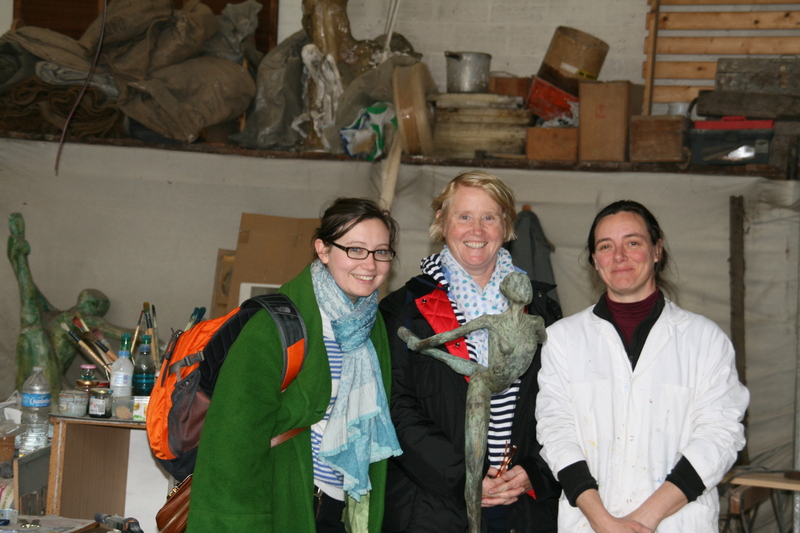 My husband, eldest daughter and I took the metro out to Saint Mande and walked the distance to Hannah’s studio. 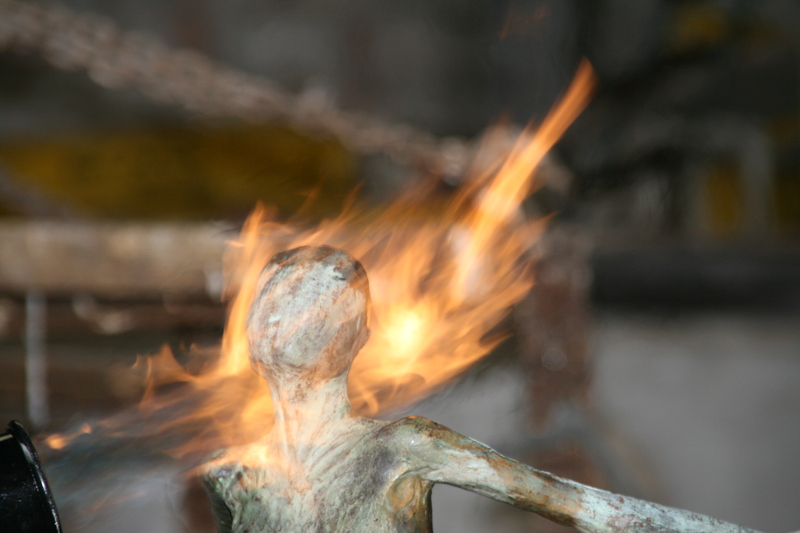 As Hannah put, or torched, the finishing touches on my Dancer we enjoyed a look round the old studio, which had been Hannah’s grandfather’s studio. I fantasized about being in Brancusi’s, or Rodin’s, studio but better because I was living the experience in the moment. When we were done, we all piled into Hannah’s Citroen (of course!) and she drove us back to the Marais where we were staying. The next day my husband and I carried the ballerina to Gare du Nord where he and she boarded the Eurostar to London, and then home. Once safely in the USA I had to find a plinth suitable to her elegance and grace. Not an easy task I found. Several local guys who work in stone told my they didn’t do plinths…interesting. Then this March at the Boston Flower and Garden Show I happened to meet Joe Gray (www.graystonemasonry.com). The rest was easy. 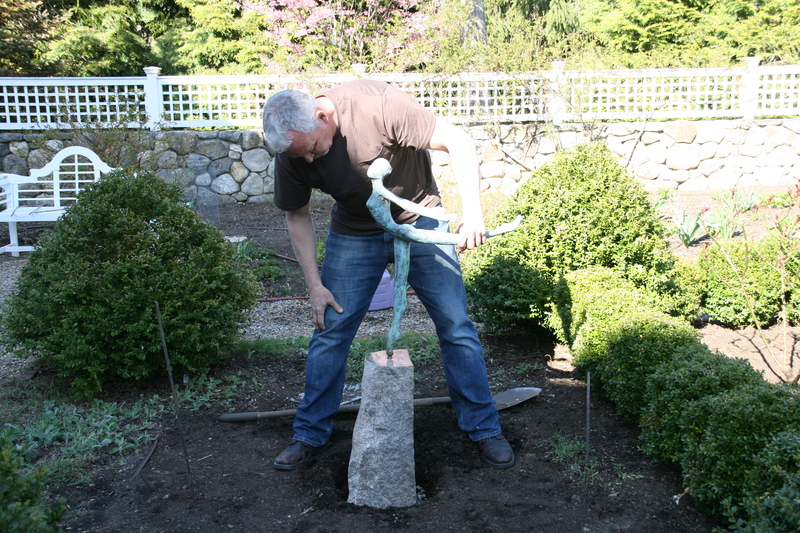 Charming, professional and creative as he is, Joe instantly and enthusiastically accepted my commission to create a granite plinth for my ballerina. A sculptor himself, he immediately saw and appreciated her exquisiteness, and knew just what type of plinth would suit her (although he allowed me to choose from a range). He installed the plinth, and lowered my ballerina into position. 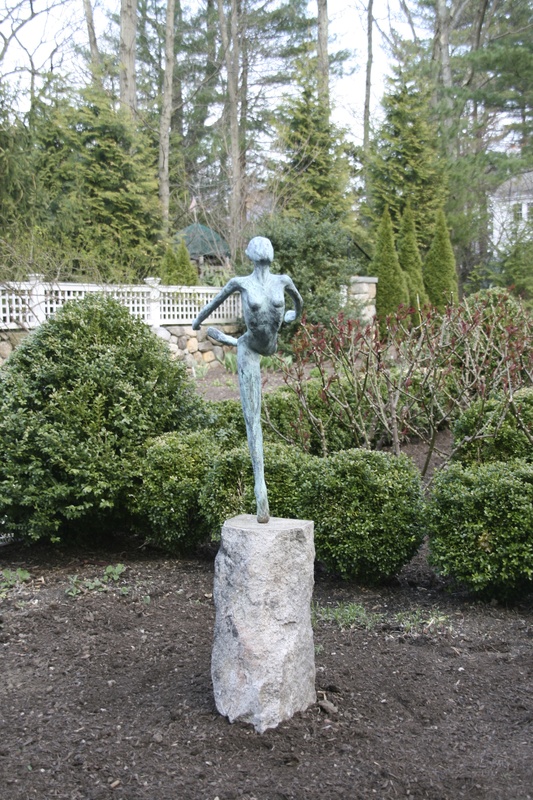 And there she stands, poised to arabesque, gracing my garden, I hope, for many years, to come. What a lovely story, and so well told! 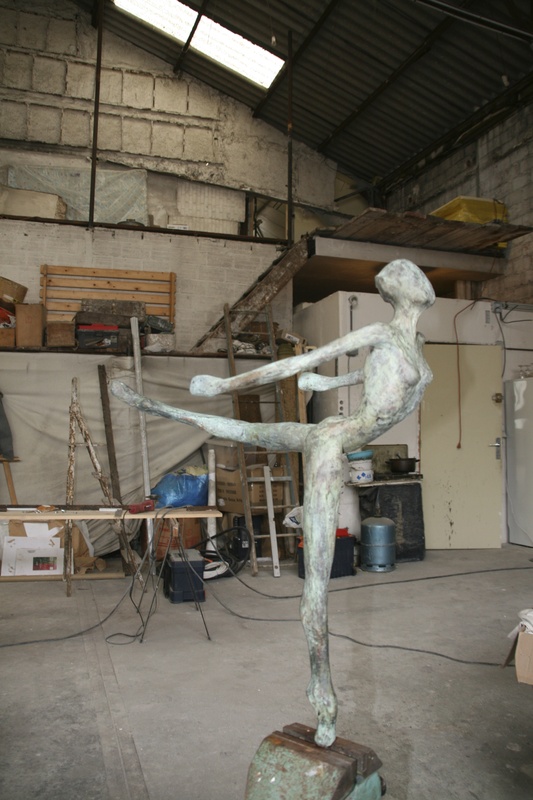 I can imagine your excitement at finding just the right piece, and then the fun of visiting the studio, finding a way to get your ballerina home, and then finally finding a plinth that looks so perfect. And your garden looks fabulous – so many roses for the dancer to pirouette through! Thanks, Fred. Yes, indeed the whole story was, and continues to be, a delight. What a fantastic statue! I want one! Thanks for you comment…get in touch with Hannah. I am sure one would look as pretty in Texas as she does in Massachusetts. She is certainly a beautiful addition to your garden. And the journey to place her is a lovely story. The entire story is enhanced with the great pictures. I love the phoenix. Amazing. Thanks, Deirdre. Glad you liked it all! Thank you for your nice comment. I would be very happy to show you My Dancer in situ. It will be nice to meet a reader of Of Gardens, a fellow blogger and a garden lover.